See what is new on the team, and what they hope to do. Reflections of a Great Trip! We beat every Oregon team record to make our best showing ever 4th place. We met many new friends especially from the Bahamas and Staten Island. Our awesome new friends from Staten Island NY were so much fun we will miss you! 182 teams set out to build a car this year 32 teams reported to the event. I am very proud of our team! Last week we went on the very first multi day trip I, Sam, planned as President of the team. We left Bend on Wednesday after school and drove to Hillsboro. (Thanks to Thomas Stueve for making us not have to walk, among the other infinite things you do for us. You are very appreciated by the entire team.) We stayed at my aunt and uncle's Ellie Beth Rickett and Giles Rickett's house in Hillsboro. We then got up way early the next morning and went to SolarWorld USA's factory after a bite to eat at Insomnia Coffee Company. This is literally the most amazing facility. As a person who is a huge solar fan, seeing where the quality solar cells are made is mind blowing and practically made me feel as if I was dreaming. I can't wait to partner with you if all goes well in the next month or so. We then drove to Eugene to see a great EV company called Arcimoto which makes awesome commuter EV's. I can tell that they truly have quite the future ahead of them. This tour was organized by Peder Norby, an awesome ambassador for alternative energy who may have let me get behind the wheel of his brand new BMW i8. Gaaaaghhhh! I still haven't gotten over the feel of driving that car. But wait, there's more. We then checked out World of Speed USA in Wilsonville, a beautiful race car museum that we may have been talking with to organize a thing with them, or much more... shh don't tell anyone. I'm not allowed to say yet. Finally, we took off for Bend again and arrived at about 10:00 PM. This was honestly one of the best days of my life. Thank you so much to the people who came with me on the trip. You truly are my best friends and you all are great fun to work with and joke with. Thanks for coming on this journey with me. Breakfast Wow!! We all went to a small coffee shop right on main street and enjoyed some great Cinnamon Rolls, Coffee and Tea. We are charged and ready to go off and tour SolarWorld. Wow what a facility. We got to see how they made 60 cells into one module. It was an amazing automated process. There was so much to learn, 42 years of knowledge and trials to take in. I can't believe that we have these same manufactured cells on our current car. It will be awesome to see them on our next car Lumidos. What an amazing experience. Arcimoto is an amazing business. We all got the privilege to ride in one of their vehicles. Also, we got a deep briefing on how the inner-mechanics work in their vehicles. Very complex and amazing machines. We can't be more amazed at these very inspirational and amazing people who are working hard on what they love. We as a team have a privilege to go tour two great companies. One of them being Solar World, and the other being Arcimoto. We hope to make as long of a connection as time will allow. Solar World is a solar cell and panel manufacturing company. Arcimoto, is a company that creates energy efficient vehicles. Then after we have toured these fantastic companies we get to go and enjoy the awesome looks and designs of a car museum named World of Speed. So excited for this trip!!! We just went on amazing tour of ISCO, a manufacturing and fabrication facility based in Bend. We look forward to collaborating with them. Thanks! 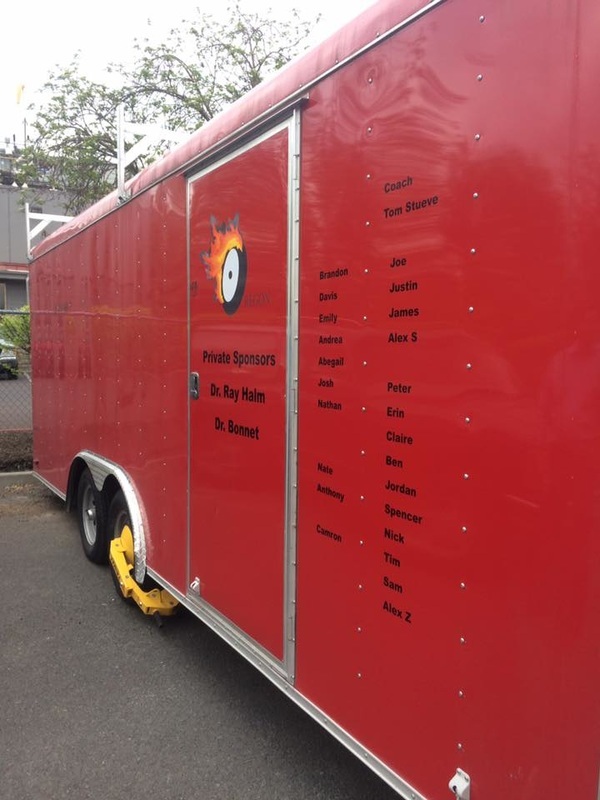 Trailer Decals finished by big cat sticker shack! We're getting decals on the trailer by Big Cat Sticker Shack! Thank you so much Ian! New member joins OREGON HIGH SCHOOL SOLAR CAR TEAM! The Oregon High School Solar Car Team has accepted a new member and her name is Mackenzie Bryant, a freshman student at Trinity Lutheran School. She is very excited to be joining the solar car team and is ready to roll into action. One foggy morning, not so long ago, the solar car team's coach realized the solar car trailer was missing. The trailer had been stolen before, but this time was different: the solar car was still in the trailer! Here the Captain, and other members of the team will be providing information about the cars current condition.